Mike Chapman is pastor emeritus of City Church (formerly “Lee Highway Church of God”) in Chattanooga, Tennessee. 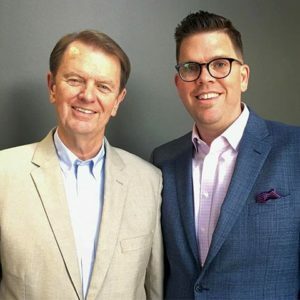 His son, Shannon, is the senior pastor. Shannon’s comments are in italics. Mike, what is the story behind Shannon taking over City Church upon your retirement? I pastored the church for 40 years [until May 2017]. The Lord impressed on me several years ago that 40 years is a generation, and I have always preached that we must empower and release the next generation. So I had decided several years ago that 40 years was going to be the turning point. Shannon had been on staff with us since 1999. He was our assistant youth pastor and then became youth pastor. Then for about 10 years, we had two venues going on at the same time on our campus. We had an “Ethos” venue, which was a young-adult, modern-type service. And then we had our more traditional type service—the “Baby Boomer” service. Even our traditional service wasn’t traditional in the sense of hymns or whatever, but it was a different feel. I knew as the church aged that we had to go back and make sure we were reaching young families and young singles. So Shannon did that for 10 years. Then when the 40-year time frame came, we merged those two venues into one. Shannon, describe the current relationship you have as lead pastor versus your dad’s role as pastor emeritus. There are a lot of stories where a father-son dynamic was too challenging and they couldn’t work together. Ours has been the opposite. First and foremost we’re family, and out of that family flows the dynamic of a working relationship. So, I’m not threatened by my dad. Of course, he’s never been threatened by me. There is a common understanding of the advancement of the Gospel and what God wants to do at our church. Even before the transition happened, I was doing a lot of the organization the last two or three years behind the scenes. My dad and my mom were still the face of all of that. When the transition came, it seemed natural. That was key. When we merged our venues in January 2016, we were meeting in the gym at that time because the main building was in renovation. We started team-teaching, meaning he would preach a week and I would preach a week. It wasn’t real systematic. We mixed it up, and it came out about 50/50. We were curious to know how people would feel not hearing him preach from week to week. Surprisingly that transition turned out to be easy. We were not trying to push our personal agendas; we were trying to help the church advance. Do you have similar preaching styles? There are some similarities. This is how I describe it to people: If Dad and I were both cooking a filet mignon, I’m going to cook mine medium. He’s going to cook his medium-well. I may season mine a little differently, but at the end we’re both eating steak. When we preach, there are similarities for sure, but I want my dad to be my dad and he wants me to be me. In the 10 years that we had two venues, we preached the same sermons in both places. We worked on them together, sometimes in more detail than other times. We would work out a year’s preaching schedule, because we mostly do series. So when we brought the venues together, it wasn’t a new thing. We were already preaching the same messages. Shannon was already chairing the deacon board; I was chairing the elders. My philosophy is, if you are making a significant shift, signal before you turn. About three years ago, I told the elders that in two or three years I would step down. About a year and a half later we had what we call a “heart to heart,” with groups of 30 to 40 people coming together for dessert and fellowship. We talked about what combining the two venues together would mean. And there I addressed the issue of my retirement with the people of the church, and said I thought Shannon deserved serious consideration as my successor, and told them why. Compare City Church to Lee Highway Church of God 40 years ago. It was a church of wonderful people, about 40 members. It was a traditional southeastern Pentecostal church. Most of the people who were here were raised in the church. I was 25 years old when I came. Almost all of the people were the age of my parents. We had a handful of people who were 35 and below. I had been outside the Bible belt. When I graduated from Lee, I went to the San Francisco Bay Area to pastor my first church. It was a little church of 18 people. I spent two years there, and then I went to Hawaii to plant a church. I thought I would be there for a while. We got the church planted, and then I knew it was God’s will for us to leave. I thought we’d be going back to the West Coast, but we were asked to go to Chattanooga, Tennessee. First and foremost we’re family, and out of that family flows the dynamic of a working relationship. I was a different person from the one who left here. I was out west at a phenomenal time. Hippies were turning to Jesus and the Charismatic Movement was just beginning. So I was reaching people who were not Bible-belters. In Hawaii I was reaching people who were not Christians at all. I organized our church without anybody in the congregation knowing about the Church of God. I had become a teacher in my preaching. I related well to people who weren’t Pentecostal or even Evangelical Christians. Today, City Church is a picture like that. We have people from just about every religious background. We have former Hindus, Baha’i, Wiccans—you name it—who have come here and met Christ. We have a charter member, Marie Beasley, who is 95 years old. She sings the modern songs we sing and claps her hands. She gets it. She understands why we are doing it. She was also one of the people who came forward and laid hands on Shannon and his wife, Mandy, when we installed them. It was a moving moment for this 95-year-old lady whose mind is clear. She put her hands on them and prayed for God’s blessing. Here’s what I believe: If you pastor a church long-term, you’re going to reinvent yourself several times. If you don’t, you’re in trouble. If you don’t continually reach young families and young singles, you have an expiration date stamped on your church. Shannon, talk about the dynamic of growing up in a church that you’re now pastoring. One of the biggest things I had to wrestle to the ground was my natural tendency to stay here out of loyalty to my dad. Mandy and I have been married 18 years and have six kids. We had to make sure this was God’s will for us above loyalty to my family. I’ve got to know this is where God wants us. That took a process to figure out. A lot of times I’ve felt like it was harder for me to stay than to go because there is so much history here. I was the first person to become a Christian in our new sanctuary. It was under construction and we hadn’t had our first service. In a conversation with my dad, I accepted Jesus Christ as my Savior. I was 7 years old. I’ve been here at 7122 Lee Highway my whole life. I love what God is doing in this city. The last three years, our church has been in a journey of reinventing ourselves through our facilities and also through our leadership. Our church is growing and we see people growing in the faith. Our story is this: Senior pastor served here 40 years. Ten years before his retirement, they stated two venues on their campus with one led by his son. Nine years later, they merged those venues together. Then they did a campaign to get their building to reflect their ministry. They moved into the new facility together. Less than a year later, the senior pastor retired. The pastorate transitioned to his son. Because of God’s goodness, because of His grace, the church is thriving.